Gosha Rubchinskiy’s spring 2018 menswear show—one of the first of the season—was presented in a far-flung destination: St Petersburg. As midnight drew closer, the show began. (Meanwhile London Fashion Week Men’s had just began earlier in the day.) 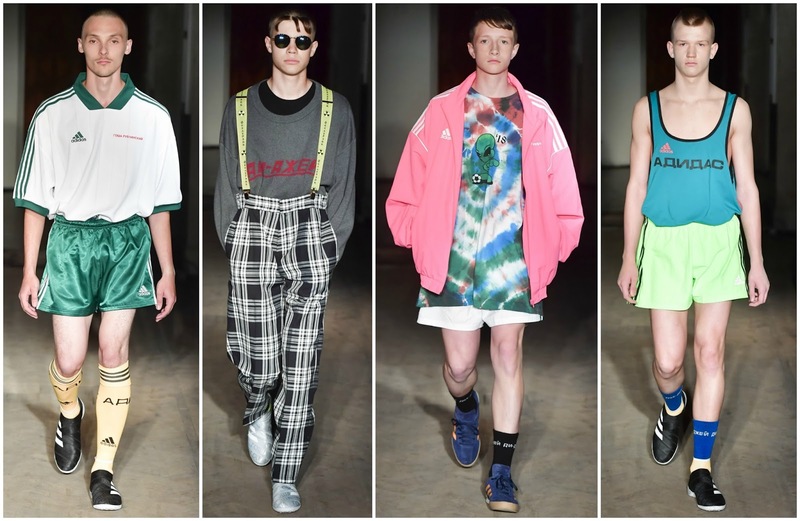 The show marked the second of Rubchinskiy’s longterm initiative with Adidas, in the run up to the 2018 World Cup which is to be held in Russia next summer. The idea behind the collaboration is to showcase a bright Russian creative and present him on the world’s stage; principal sponsor Adidas in turn jet editors from around the globe to promote Russian tourism ahead of the event. It’s a win-win for all involved: Adidas flex their business muscle and earn supernormal profits with the willingness of Rubchinskiy’s fanbase; Rubchinskiy’s business continues to blossom, assisted by the sponsorship; Russia, too, benefits from the presence of both. We’ve seen Vetements x Juicy Couture. Louis Vuitton x Supreme. Sacai x The North Face. Unsuspecting collaborations are all the rage in the fashion industry currently. Next up? Gosha Rubchinskiy x Burberry. Yes, you read that correctly. The Russian designer and Christopher Bailey crossed paths to create a reinvention of the trademark Burberry check—the print that the brand began to dissociate with in the early 2000s when it connoted to celebrities associated with “chav” culture in the United Kingdom and the proliferation of counterfeits. It isn’t unsurprising for Rubchinskiy to choose this print, a lesser-appreciated, almost inferior, print. After all, his obsession with nostalgia (and the world’s current preoccupation with it) coupled with his love for subverting working class codes brought him to this concept. It came in the form of large shirts and roomy shirts—it conjured an image of a dorky boy on summer holidays. Fetishising working class codes has long been one of Rubchinskiy’s primary motivations—specifically the youthful offsprings in working class families. He targets them with relatively accessible price points, his sporty or skate-influenced aesthetic. It could be considered morally dubious marking up the mundane, but Rubchinskiy does what he does best and he doesn’t appear to be stopping. A quick Google search will also present one with information on the Burberry check’s association with football; “football hooliganism” led to garments using the print to be banned from certain venues. Football is linked closely with this collection, as aforementioned. This season it was total immersion into the football gimmick. Sports kits were designed, the loose-fitting, 80s-inspired jersey top with slinky emerald green bottoms, or a goalkeeper’s vest in a punchy peach; socks were knee height and the shoes were loosely based on studded boots worn on the field by the virtuosic sport stars. Youth culture-informed, the sportswear elements to the show cannot be denied as impactful. However, the rave culture aspect to it is where Rubchinskiy intended the focus to be directed. The Mariinsky Theatre was the home to the Russia’s inaugural rave. Fluorescent accents, brightly-coloured trousers and rainbow tie-dye pieces dominated the lineup. I envision Rubchinskiy’s legion of hopelessly devoted fans lining up outside Dover Street Market clamouring to purchase one of the tie-dye pieces, before posting them to Instagram, building the hype—the advent of social media is the reason why his is a successful label. Without the internet, there wouldn’t be endless resources and access to imagery and history of 90s raves. Not only would it be unavailable to the designer, but to the teenage boys who scour Instagram and Tumblr and obsess over this culture. 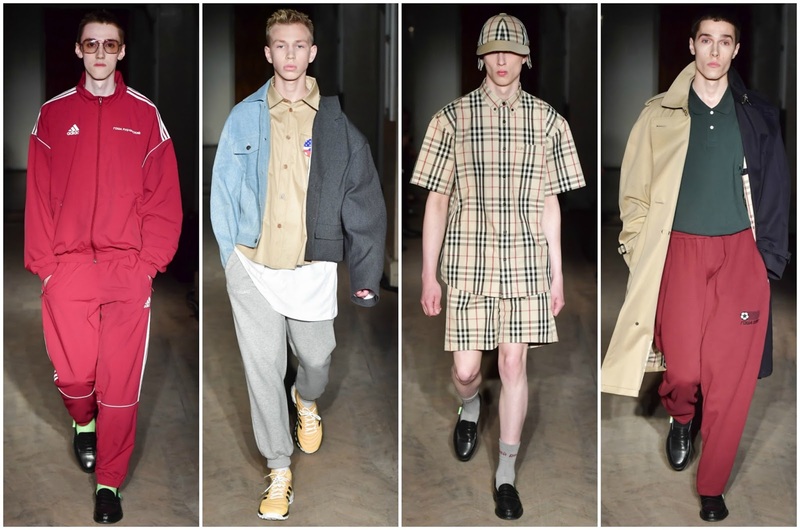 With the Burberry collaboration, the Adidas initiative and the emphasis on rave culture at play in this collection it was the first time when I truly felt robustness suited Rubchinskiy. There were a lot of talking points and each of them as interesting as the next. It might be considered naive to pander to youths but one has to remember how those in their early twenties and thirties could buy into these clothes also. As I said previously, Rubchinskiy does what he does best and he doesn’t appear to be stopping.